Hold on, you mean there are other things to do in Walt Disney World other than visiting the theme parks?! There sure is! Though you would be forgiven for not knowing, for years I didn't look any further than the theme parks for entertainment but there is so much more to Walt Disney World, you just have to look a little closer. 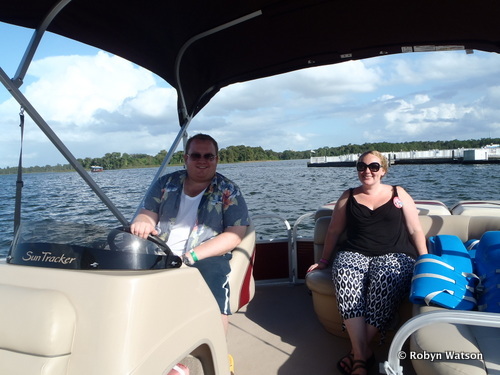 As my husband and I have been visiting for the past few years we decided it was time to take things a bit slower and enjoy other things that Disney has to offer beside the parks, and one of the first things we thought to do was hire a boat on Bay Lake and the Seven Seas Lagoon. 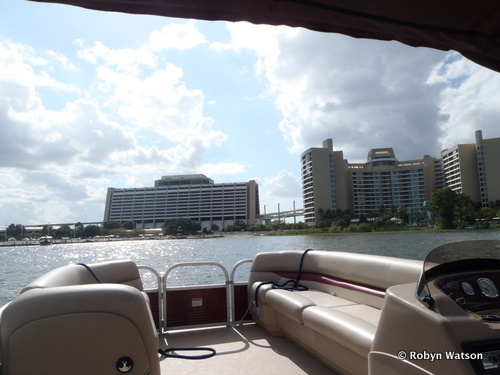 We chose to hire at the Contemporary Resort Marina as we were staying at Bay Lake Tower however you can also hire boats from marinas at Wilderness Lodge, Polynesian and the Grand Floridian. 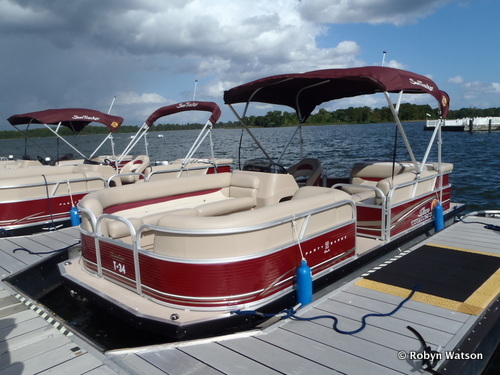 Boats are also available to hire at the Epcot Resort marinas are on Crescent Lake. Sy and I walked up to the rental desk at the marina and asked about hiring a boat. 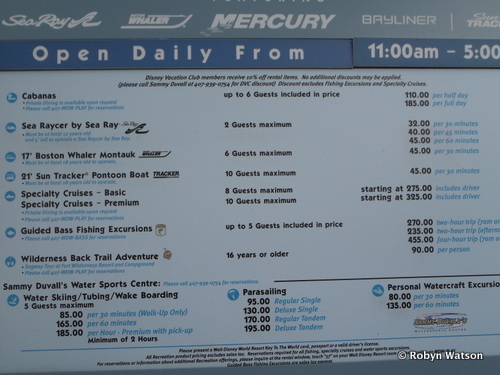 We weren't sure which boat to go for, however I did know I wanted one of the bigger boats and not one of the Sea Raycers as you have to wear your life jacket at all times on the Sea Raycers and on the bigger boats you just need to have it with you on the boat. We decided to go for a Sun Tracker after some advice from the cashier - she said these are slightly more comfortable than the Boston Whaler as they are a little larger, both boats are the same price. We had to sign a waiver and show ID for the driver. I didn't want to steer the boat and as my husband is nautical anyway we put him down as the only driver. We were given different coloured wristbands for driver and non-driver. Sy really enjoyed driving the boat, he has got lots of previous experience however that would not have mattered as it was very easy, I think even I could have given it a go myself! They then told to keep the boat out for as long as we wished and we would pay at the end, the minimum time however was 30 minutes. Each of us picked up a life jacket each and were taken out to the boat by a different Cast Member who showed us how to operate the boat and gave us a few instructions eg; give way to bigger boats and any problems to wave over to the lake patrol boats and they would come and assist. We started on our way however there was a problem with our boat so reversed back, there seemed to be some sort of engine trouble. Back at the dock we explained to the cast member and were soon sailing back out on another boat. Out cruising we went to see all of the Magic Kingdom resorts and then went to look at the old River Country and Discovery Island, not that there was much to see sadly. Before we knew it 45 minutes had passed and we were heading back in. As we pulled in 2 cast members came over to help us moor the boat, they also took a couple of pictures of us together as the driver must not use a mobile phone or camera while driving the boat. We then went over to pay for our time, its worth noting that with both annual passes and DVC membership there is a discount. The cast member who helped us before with the engine trouble came over and thanked us for letting him know, he went to drive it and knew right away that there was a problem so it was going off to be looked at later that day, good job my husband knows what he's doing as I would have carried on with the broken engine. We left the dock and headed back over to Bay Lake Tower after a wonderful time, in fact it's already in the plan for our next trip we enjoyed it that much. I don't think you could go wrong with any of the boats to hire, I might try one of the smaller Boston Whaler boats next time as they seemed to go a little faster however there was definitely more room on the sun tracker. 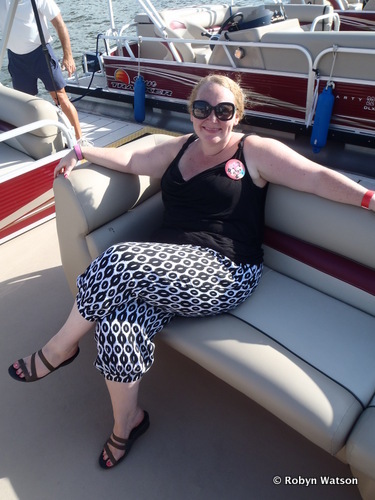 Thanks so much to the lovely Robyn Watson for sharing her boat rental experience with us in this guest post. You'll be able to read more of her fun Disney adventures soon, right here! In the mean time, find more from Robyn over in our member forums. Great guest post Robyn! I haven't rented a boat for at least a decade but you make me want to add it to our next trip.